With so many of us focusing upon our health these days, we’re looking for healthy breakfast ideas which often includes smoothie recipes. Let’s be honest folks, many of them taste like dry chalk and it can be disappointing to throw perfectly good fruits and veggies into the blender to find out the result is nothing short of gross. Thankfully I’ve found quite few smoothie recipes which I actively share here, today’s is a high-protein smoothie recipe that has a thicker consistency, much like a milk shake. 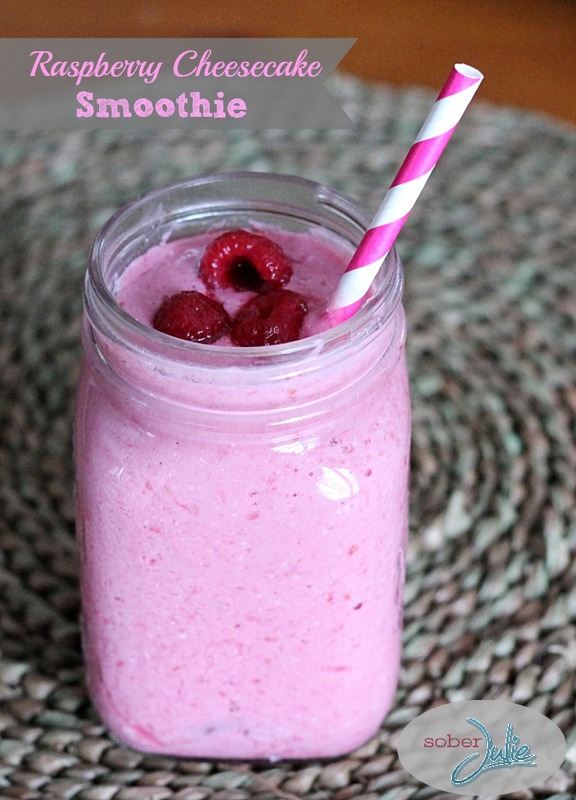 It’s a raspberry cheesecake smoothie (yes it really tastes like cheesecake) which uses cottage cheese and is delicious! 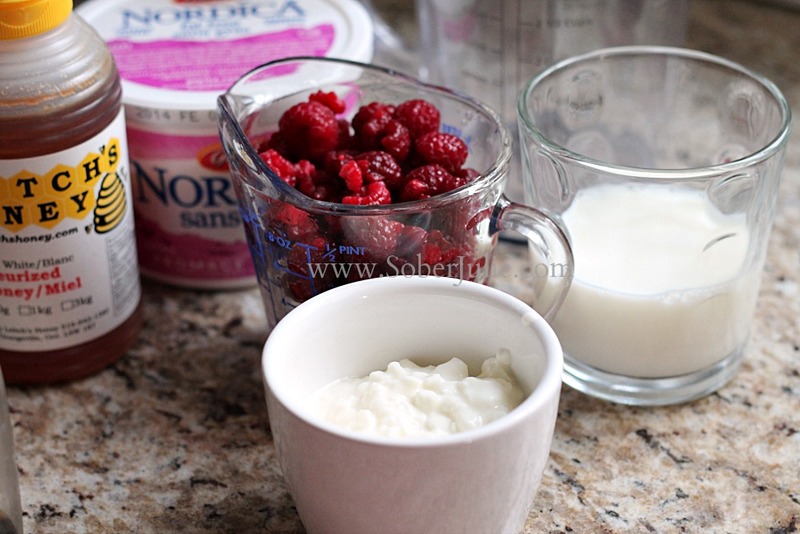 Cottage cheese is a great option in recipes to boost up your protein levels, while keeping the carbs and fats low. Cottage cheese has a high content of casein protein (a longer-lasting protein) which keeps you feeling fuller longer. Thankfully this one is simple for early mornings! Place all ingredients into the blender and blend on medium/high until it reaches your desired consistency. For those who prefer something sweeter, feel free to omit the honey and use sweeteners. 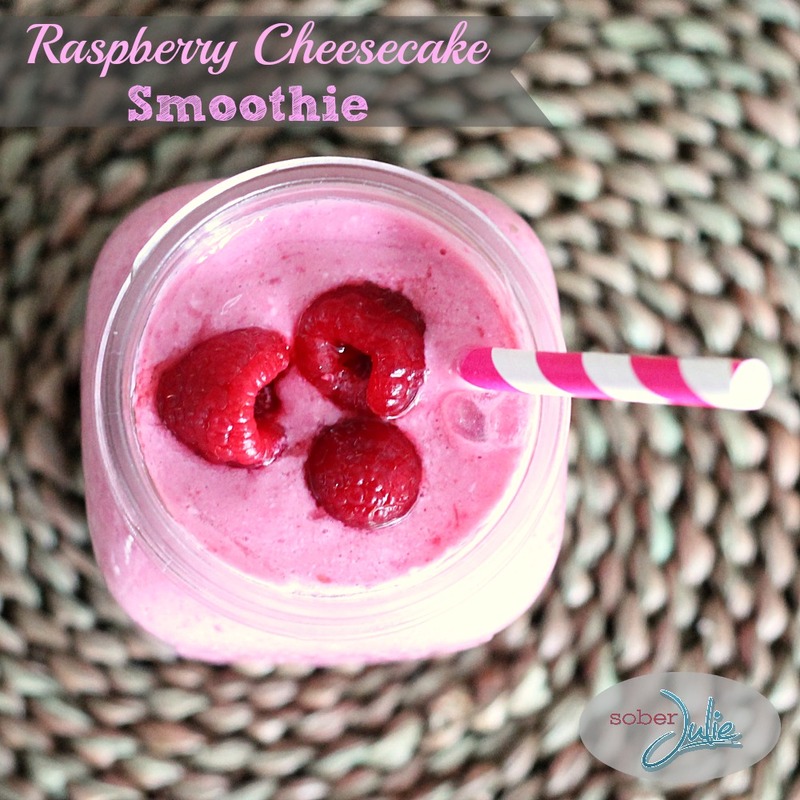 A protein-rich raspberry cheesecake smoothie which has a thick consistency. Place all ingredients into the blender and blend on medium/high until it reaches your desired consistency. To enter, simply fill out the Rafflecopter form below. Readers may enter across many blogs, they may only win on a single blog. Entrants must be a resident of Canada, however those in Quebec are unfortunately unable to enter the giveaway. Winner can expect their prize in approximately 4-6 weeks! Gay Lea has given me 12 coupons for free Gay Lea product to one reader in Canada, excluding Quebec. To enter, simply leave me a comment telling me what you eat as a healthy breakfast. Giveaway ends Jan. 20th, winner will have 48 hours to respond. Readers may enter across many blogs however win from only one blog. Winners can expect their prize within 4 to 6 weeks after the giveaway ends. When I eat breakfast I enjoy sometimes having fruit or a bowl of oatmeal. I like cottage cheese in lots of different things, but my favourite is in Paska spread. Paska is a special Easter bread, and the spread is yummy – plus it brings back happy childhood memories. For healthy (and quick) breakfasts I prepack oatmeal and dried fruit, just add hot water and stir. AE cottage cheese with seasalt. I like cottage cheese with cup up fresh fruit, pineapple is especially nce. I’ve made an alfredo sauce using cottage cheese before…. 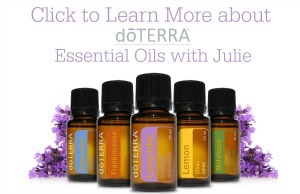 turned out very good, and much better for you than traditional! I’m generally not a breakfast eater, but if I were to eat a good breakfast I would have cereal, yogourt, a banana and fruit juice. I like to put it in my lasagna. I’ll be lucky if I can get away with OJ and toast in the morning. That’s healthy. I use Becel. I eat oatmeal with nuts and dried fruit mixed into it along with some protein powder! Healthy breakfast for me is multigrain bagel with cheddar. My normal breakfast is an All Bran bar, light yogurt and fruit (apple or banana). Oh my gosh that looks so yummy! I have going to have to try this for sure! My healthy breakfast includes steel cut oatmeal, banana & yogurt. Or if I am in a hurry a smoothie with fruit, almond milk & yogurt – never thought about putting cottage cheese in it, will definitely have to try that out! My usual healthy breakfast is toast (with Becel) and tea. Sometimes have oatmeal or steel cut oats. I don’t eat cottage cheese but for breakfast I eat a bale of hay(shredded wheat). I like my cottage cheese just regular plain . I like eating cantaloupe filled with cottage cheese. I eat green smoothies every day for breakfast! I eat many different things,,oatmeal,cereal,toast,waffles,pancakes,mufins,fruit,etc.. I love to make pancakes with it. I eat oatmeal with fruit. Eggs, toast and a smoothie with berries, banana and juice. It’s my biggest meal of the day! my breakfast is usually Special K with 1% milk. Coffee on the side of course. For breakfast, I eat oatmeal with fresh blueberries. I love cottage cheese with crackers! For breakfast I eat a mixture of stone ground oatmeal, greek yogurt, milk, chia seeds and I add different fruits on top. It is soooo delicious and I never tire of it. I eat yogurt and berries for a healthy breakfast. My breakfasts aren’t always healthy, but one of my favorites is cod liver spread on a pumpernickel bread. I love cottage cheese on toast! I like to have a smoothie for breakfast. That way I can eat it on the go! For a hot healthy breakfast I like to eat oatmeal, otherwise I eat Special K cereal. I love cottage cheese with just a bit of pepper or as a dessert with some fresh fruit! I usually eat egg whites with mushrooms, cherry tomatoes, and green peppers cut up into it. if not that then regular oatmeal and I heat up frozen fruit to sweeten it up. For a healthy breakfast I like to change it up daily, Cream of wheat, raisin bran, fruit and once a week I have eggs, bacon and toast. almost every morning I have a bowl of gluten free Rice Chex and a piece of fruit. My healthy breakfast typically consists of almond/cranberry oatmeal, that I add chia, hemp hearts and almond butter to. I also like at and either cottage cheese, or hard boiled egg on the side. substitute brown sugar with coconut sugar (half the amount listed in recipe), used coconut milk and ommitted butter entirely, still amazing! I have been eating a warm multi grain cereal (Sally’s) lately and find it is keeping me full!